The new DOD Boneshaker is a straight-pipe, hard-tail run down and dirty, choppy road. A distortion pedal like no other, the Boneshaker is supercharged with a 3-band parametric EQ that drives its gain to add more frequency-specific, bowel-churning lows, more bare-knuckle mids and more responsive highs. Basically, more of everything! 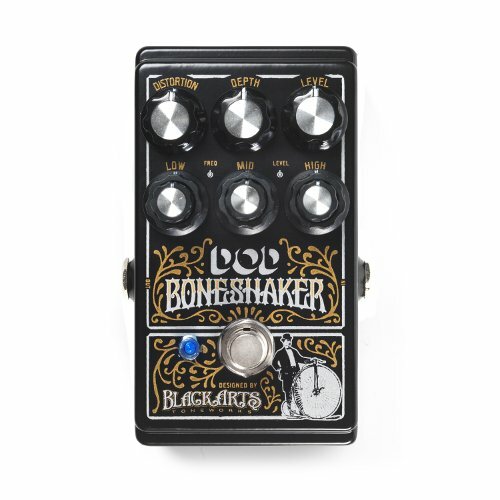 Black Arts Toneworks designed the Boneshaker's circuit specifically for extended-range guitars, baritone and bass - anything heavy, loud and low. Stacked, solo, into dirty or clean channel, the Boneshaker will shake you to your core. In addition to the Boneshaker's Distortion, Depth and Level controls, it also features independent Low Level, Low Frequency, Mid Level, Mid Frequency, High Level and High Frequency controls. It's that incredibly versatile 3-Band Parametric EQ that makes the Boneshaker stand out from all other distortion stomp boxes. Grab one of its EQ controls and hold on for the tone-shaping wild ride of your life.